Surface Pro features the same magnetic dock connector that Surface RT does. Unlike similar hybrid or convertible designs that came before it, Microsoft didn’t make the mistake of requiring a different set of docks for the Pro. All existing Touch and Type covers work perfectly with Surface Pro. Microsoft maintains that we will see other accessories that use this custom dock connector, even from third parties. I already shared my thoughts on both covers in our Surface RT review so I won’t rehash all of that here. In short, the Touch Cover is probably one of the best tablet display covers I’ve ever used. It adds a marginal thickness (~3.3mm) to the tablet, but in exchange for the slight inconvenience you get a cover that you never have to remove and a keyboard that, albeit not perfect, is at least better than typing on a glass touchscreen. The Type Cover is a bit thicker than the Touch Cover (~5mm) but you get real keys, which does wonders for improving the typing experience. Both covers feature integrated trackpads, and neither is particularly great. Reaching out and touching the screen is a far better experience than trying to use the integrated trackpad for anything serious. Microsoft also offers a Surface styled wedge mouse, but I feel like having to carry around something else that’s not attached to Surface detracts from the whole tablet experience. The more productivity focused nature of Surface Pro almost makes you want to use the Type Cover exclusively with the tablet though, whereas I felt the Touch Cover was the right pairing for Surface RT. You can obviously use either with Pro. As a writer I’m more likely to gravitate towards the Type Cover given its superior typing experience. I’m beginning to wonder if there might be a fair amount of manufacturing variance between Touch Covers. 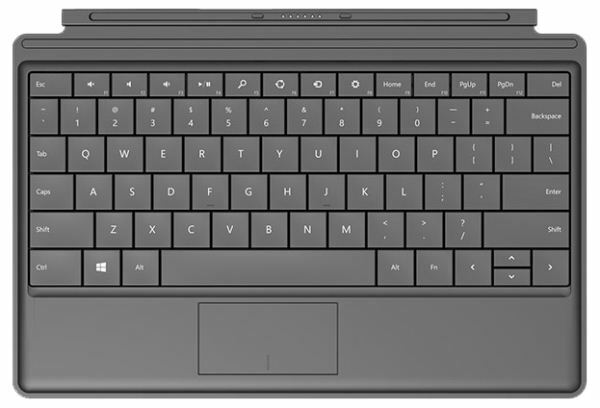 If you remember back to my Surface RT review I mentioned that the Type Cover seemed to miss keystrokes. With my Surface Pro review unit Microsoft sent another Type Cover. This one seemed to miss fewer keystrokes than the original Type Cover I tested with. I originally surmised that missed keystrokes with the Type Cover might have been a performance issue, but with a full 17W Ivy Bridge under the hood of Surface Pro I don’t think that’s the case. Although Microsoft spent a great deal of time focusing on the build quality of Surface, I wonder if the same didn’t necessarily apply to the Type Cover. Although the added thickness of the covers didn’t really bother me with Surface RT, I have to admit it did with Surface Pro. It’s all about perspective since the Surface Pro + Touch Cover is still thinner than most notebooks, but for a tablet it definitely doesn’t help Surface Pro feel any more svelte. I wouldn’t give up either cover and I used Surface Pro with one attached at all times, this is just another plea for a thinner design - something I’m sure we’ll get with Surface 2. This brings me to my next point, which is about the lack of any keyboard bundles with Surface Pro. Microsoft charges a hefty premium for both of its covers. Touch Cover will set you back $119 while Type Cover is $129. While I can logically justify the price tag of Surface Pro, you really need to add $120 - $130 on top of that because it doesn’t come with a physical keyboard of any type. 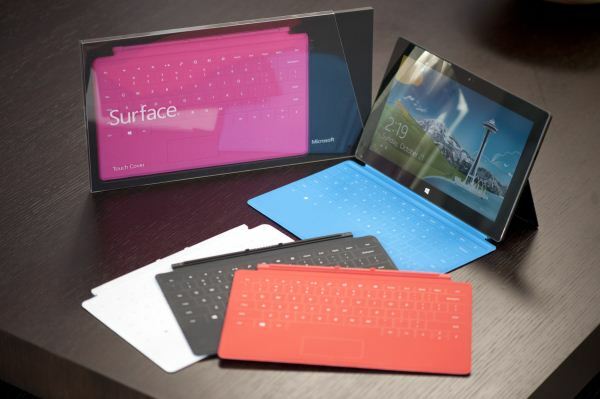 Given the more content creation lean of Surface Pro, I’d like to see the $899 or $999 include a Type Cover. I understand that heavily eats into margins of a device that’s likely already pushing the limits given that it’s really at the forefront of a brand new tooling and manufacturing process for Microsoft, but it really has to be done. Perhaps once economies of scale kick in Microsoft might look into tossing in a free Type Cover. Earlier I spoke about the issues with the kickstand while using Surface RT in your lap and how many of those same complaints apply to Surface Pro. The same is really true for the keyboard covers. While the kickstand + keyboard cover combination does a great job approximating a notebook when used on a desk, in your lap it’s a different story. The combination works, but it’s obviously not as rigid as a notebook. And you’re pretty much hopeless if you’re sitting in a funny position. Whereas you could cross your legs and still use a notebook in your lap, doing so with Surface Pro with kickstand and keyboard cover is far less manageable. And good luck trying to use Surface Pro as a notebook in your lap if both of your legs are crossed. The lack of rigidity in the connection between the keyboard and display combined with the fixed position kickstand can create some awkwardness. It’s all workable, but it becomes a lesser experience compared to a notebook. This is the Surface tradeoff.